. . . [a] stupendous technique . . . a thoughtfulness and depth beyond his years . . .
. . . [When you hear Abduraimov's performances] you can't help but be carried away by the kind of wild and bursting young talent . . . full of fire and brimstone . . .
. . . he tackles Prokofiev's Piano Sonata no. 6 with both youthful eagerness and maturity. That maturity is even more evident in Liszt's reflective "Bénédiction de Dieu dans la Solitude", whose subtle shifts of timing and emphasis he negotiates with apparently effortless command. Mark the name . . . [Behzod Abduraimov] is a remarkable young pianist, and it is well worth getting in on the ground floor with this debut disc of Prokofiev, Saint-Saëns and Liszt . . . an artist not only of extraordinary technical ability, but also one with a terrific musical personality and sensibility. Those qualities come through clearly on this disc . . . [Saint-Saëns: "Danse macabre"]: a startlingly mature interpretation that not only demonstrates his athletic pianistic prowess, sureness of touch and clarity of detail but is also infused with subtle tonal shadings and a real sense of the music's menacing, demonic power . . . Abduraimov shows his understanding of musical character and his marked gift of communicating it through his playing . . . there is no doubt that Abduraimov has the right intellectual and digital equipment, and the intelligence to seek musical substance beneath the surface of the notes, and in time his approach will broaden and deepen in emotional scope . . . [a] glowing testimony of a talent that is already compelling and certainly one to watch. With hands springing off the keys faster than the eye could register and his body almost levitating with excitement, he combined unbridled joy with an impressive technical control . . . [the Prokofiev] reflects very much a young man's vision.
. . . he's a new face on the scene with bags of talent whose future will be well worth following.
. . . this young Uzbek pianist has paced his career intelligently . . . and this debut disc suggests his patience has paid off . . . An inventive transcription of Saint-Saens's hackneyed classic allows him to establish immediately his light, transparent touch and immaculately controlled pyrotechnics, while in the middle section he displays a Lisztean grace . . . [Prokofiev: Piano Sonata no. 6]: The sly humour of the staccato second movement comes deftly across, as does the quicksilver finale . . . [With Liszt] Abduraimov seems totally at home. "La benediction de Dieu" is conceived with such refined attention to pace and detail that the poetry is fully released, with the sound possessing a silky sheen; the "Mephisto Waltz" is a reminder of the high-octane virtuosity which brought him to international attention in the first place.
. . . prodigious digital dexterity and keyboard technique . . . [Prokofiev]: one would expect him to be in full command of the sonata, as well as the other works on the disc, and without exception he is. Abduraimov possesses a phenomenal technique that enables him to toss off these very difficult pieces like a tornado tossing cars and cows through the air . . . hair-raising technical prowess . . . Abduraimov is unquestionably a highly gifted pianist with huge potential who bears watching. He has the neuro-motor responses of a jungle cat and the energy reserves of an Olympic athlete on peak form . . . It is easy to imagine how thrilling the Prokofiev Third Concerto, with which Abduraimov won his First Prize in the 2009 London International Competition, must have been . . . Abduraimov's "Danse macabre" glitters like a diamond: clean, pristine and capable of cutting through glass.
. . . [this disc] comprises dark and explosive repertoire, filled with dramatic narratives that Abduraimov eagerly immerses himself in. His "Danse Macabre" sends chills down the spine, and the "Mephisto Waltz" is utterly engaging, presented with rock-solid technique. 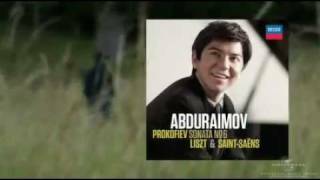 Similarly, Prokofiev's Piano Sonata No 6 and Liszt's "Bénédiction de Dieu dans la solitude" reveal Abduraimov's intellectual curiosity and an artistry that can only blossom.
. . . il sait capter, et restituer sans taper ni tricher, la douleur révoltée de cette musique prise au piège d'un monde qui s'écroule. Aucun détail des colonnes de blindés (Allegro moderato), de la désolation des décombres (Tempo di Valzer), des éclats d'obus (finale) n'échappe à son analyse et à sa sensibilité. Mais le sommet de ce programme, auquel on viendra se ressourcer et qui nous rend ce pianiste d'emblée attachant, c'est la "Bénédiction" de Liszt . . . Behzod Abduraimov développe des qualités d'imagination sonore inouies. Effets de liquidité, de coagulation, de jaillissement et de ruissellement (le troisième volet! ): le jeune homme a compris que c'est le son qui seul structure cette musique portée par l'exaltation du sentiment religieux. Puissent tant de qualités de maîtrise et de maturité se préserver de la violence et de la vanité du monde qui l'entoure, et nous revenir bientôt!